Perhaps one of the most familiar psychological ideas of our time is the Maslovian hierarchy of needs, and the most familiar form of the exposition of the hierarchy of needs is that of a pyramid resting on a broad base of physiological needs, culminating with self-actualization at the peak of the pyramid. To fully appreciate Maslow’s hierarchy of needs and his humanistic pyschology which serves as the conceptual framework of the hierarchy of needs, all of this must be understood in comparison to (and indeed in contradistinction to) the tradition of Freudian psychodynamic psychology, which, when Maslow was writing, was the dominant school of thought in psychology. Freud began as a physician, and approached the human psyche as a physician. “Success” in Freudian psychology is formulated in the most minimal and modest way imaginable — this is the famous idea that, “…much will be gained if we succeed in transforming your hysterical misery into common unhappiness” (cf. From Neurotic Misery to Ordinary Human Unhappiness). Freud did not focus on what makes an individual mentally healthy, but on treating specific pathologies. Patients came to him with problems, and he tried to cure them. The cure was considered efficacious if the patient was relieved of their neurotic misery and returned to a condition of ordinary human unhappiness. Maslow had something very different in mind. His systematic works like The Psychology of Being don’t focus on the treatment of specific pathologies but instead seek to understand and define the human person in its optimal state of being, especially in relation to “peak experiences” and self-fulfillment. Ordinary human unhappiness is not good enough for Maslow; he wants to see the healthy individual converge upon a state of psychological self-actualization in which the highest spiritual goods are realized and personal fulfillment is achieved. All of this sounds wonderfully inspirational, but I am deeply troubled with the implications of Maslow’s hierarchy of needs in the same way that I am deeply suspicious of Erikson’s stages of personality development. There is a perennial human tendency (perhaps rooted in a cognitive bias) to mistake (or even to twist) a description into a prescription, transforming an analysis into a norm. Thus one might say that if you aren’t experiencing the particular psychosocial crisis that Erikson has defined for the stage of life in which you find yourself at present, then there is obviously something wrong with you and that you aren’t developing naturally or normally. Similarly, it might be asserted that if you are not going about clambering up the hierarchy of needs in an orderly and linear fashion, starting with the satisfaction of your physiological needs and gradually working your way up to spiritual self-actualization, then there is something wrong with you, and you need to start over and get it right next time. One cannot, of course, blame Maslow or Erickson for he dumbed-down versions of their ideas that have filtered into mass consciousness by way of simplified expositions in the mass media, but there are insidious assumptions built into the hierarchy of needs (and, for that matter, Erikson’s stages of psychosocial development) that are intrinsic even to the most refined and sophisticated expositions. Let me start with something basic — something drawn from the most fundamental physiological human needs. Even if you are tired, hungry, thirsty, and cold, if you see a violent mob moving in your direction you are going to run the other way to keep yourself alive, despite your immediate physiological needs. While these physiological needs are the basis of human well being, I can’t imagine Maslow telling someone about to be murdered by a mob that they ought to get something to eat and drink, put on more layers of clothing, and then get a good night’s rest before running to save their lives. This is the reductio ad absurdum of the hierarchy of needs, and such an observation in no way vitiates the overall scheme, insofar as any general scheme must admit of exceptions. If that were all, appropriate exceptions could be built into the hierarchy of needs to accommodate immediate exigencies, but that isn’t all. The very idea that our moral life is a distant and expensive luxury that occurs at a peak of self-fulfillment and self-actualization (perhaps reserved for exemplary individuals) is so profoundly misleading that it falsifies what it means to be human. Let us consider another example. If you find yourself isolated, without friends or family, and thus lacking all the components of love and belonging — and, to formulate this even more strongly, perhaps you see no way whatsoever of lifting yourself out of this isolation — and you use this isolation to focus on the fulfillment of a higher creative or moral calling (instead of fruitlessly expending your energies trying to fulfill this level of the hierarchy of needs, in order to move up to the next level in an orderly and purposeful manner), is your flaunting of the hierarchy of needs a sign of your pathology? Some of the greatest works of art in human history, the pinnacle of achievement of what would ordinarily be thought of as the work of exemplary individuals, have grown out of circumstances that seem to pervert every assumption built into the hierarchy of needs. Certainty there is sense in which the construction of great communal projects such as the Parthenon, Chartres cathedral, or the Taj Mahal rest on an established material and intellectual framework which is the civilizational equivalent of physiological needs, but the hierarchy of needs was formulated to describe individual psychology and not the functioning of exemplary civilizations (though it may be applicable to this also, mutatis mutandis). Certainly in some individuals we see a progressive fulfillment of needs from the physiological to the intellectual, but I don’t think that this is an adequate, or even a fair, portrayal of the further reaches of human nature. I have often said that, “…I don’t believe that a person can get out of bed in the morning without implicitly having formulated a philosophical judgment that life is worth living and therefore there is a reason to get out of bed, and not merely to lie there and do nothing.” (cf. Doing Justice to Our Intuitions: A 10 Step Method). 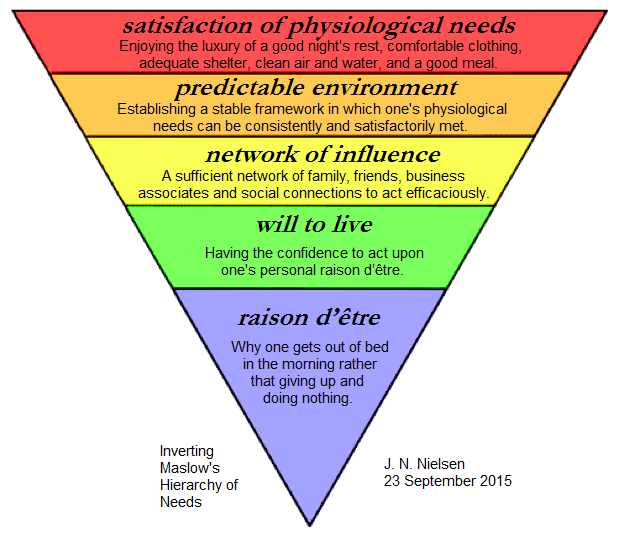 Taking this as the basis for all else that follows from this experience of the human condition, it is in this sense that I have used “raison d’être” as the foundation of an inverted hierarchy of needs (see illustration below). From the individual’s raison d’être at the foundations of an inverted hierarchy of needs there follows, in perfectly reverse order, the fulfillment of emotional and psychological drives eventually building up to the final satisfaction of physical drives and needs. While it is true that if you do not have air you will die within minutes, and if you do not have water you will die within days, such immediate exigencies can be compared to the immediate exigencies noted above in relation to Maslow’s formulation of a hierarchy of needs: the existence of these immediate contingencies in no way vitiate the overall scheme. An inverted hierarchy of needs admits of certain exceptions. Granted these exceptions, I find this to be a more accurate depiction of actual human experience than Maslow’s version. A revised and expanded version of this can be found at Inverting Maslow’s Hierarchy of Needs, Revised and Expanded, as well as two addenda, Addendum on Inverting Maslow’s Hierarchy of Needs and Another Addendum on the Moral Psychology of Needs. Great post. I came to the exact same conclusion recently while considering living a life that is more purposeful and that is focused on a vision, core values and passion. Every time you listen to a successful person speak, they always say follow your passions and the rest will follow. It makes sense. If you follow your passions and core values you’ll have a higher sense of self esteem, attract others to you who also share those values, purpose, vision, mission. From there one should be able to gain material and financial success to support a more structured life. Rather than an inverted Maslow pyramid being a model for the “starving, tortured artist” it is a model for living a life as a social being who looks to solve problems with others. It is a model for outstanding, values driven leadership. Thanks for your note. I wouldn’t express myself in exactly the same way you formulate this, but another perspective is always valuable. For my part, I have always been suspicious of individuals who offer as advice, “follow your heart” or “do what you love” with the reassurance that everything will turn out well. I usually find that there are hidden qualifications to this heartfelt advice. And I speak as one who has truly done what I love to do without any thought of reward, remuneration, or approbation. On an intellectual level this has been a fulfilling experience, but it is definitely not for everyone. As an autodidact, I am isolated, and I am sure that more exchanges with others would improve my overall intellectual development. And having pursued what I love without thought of making a living at it has meant that I must make my living some other way, and this has not been a good experience. However, as I said, there are usually implicit conditions built into stirring advice, and the kind of things I have mentioned offer an outline of the implicit conditions. When I speak plainly in this way to others, they will say things like, “Well, yes, of course, you have to have a career/go to school/network… and so on.” But this was never part of the original advice. And for the purist, it is all vanity. Also, I can say with all honesty that no one has attracted to my values, purpose, vision or mission as a result of my single-minded pursuit of ideas. In any case, I have gone off on a tangent (a tangent that is personally meaningful to me, but perhaps not forgivable for exactly the same reason). But I do agree that we ought to see the inversion of the Maslovian hierarchy not in terms of some paradigm of failure but rather in terms of the achievements that are made possible by putting aspirations first. I do not agree with this post. I appreciate you posting it, and working to help others with the acquiring of knowledge. And it might hit a note with some people. However, In my point of view and in my current situation I am in I more follow Maslow’s Hierarchy of needs. The reason being, is that I fall short of having sufficient self-esteem to truly be self-actualized. I think of myself as under-accomplished and under-appreciated. So when I make a mistake I do not accept it for fear of it reinforcing my preconception that it makes me less valuable as a person. This error in my life demonstrates my lack in self esteem. And it works as a barrier to my self actualization. And I can see how a person could not feel valuable if a person has never been loved(i.e a terrible childhood). The evidence you gave of people denying themselves their food and the company of others to serve a higher purpose was slightly erroneous. Although, it demonstrates that Maslow’s hierarchy is not as rigid as it seems as you pointed out coherently, it doesn’t serve to prove it wrong. Most likely these people have felt loved and appreciated sometime in their life to boost their confidence and equip them with the tools necessary to self actualize or to be “the best possible version of yourself”. And furthermore, respectively not to discredit or discourage you, but it doesn’t prove the norm of the “true human experience” as being an inverted Maslow’s pyramid, by the few examples of well known individuals. Maslow has done the same thing, some of the few well known “self actualized” individuals according to “Psychology today” on Maslow’s hierarchy of needs were actually Einstein and Thomas Jefferson. A founding Father of our country and a Genius. 1. It is important to look at the hierarchy of needs not as immediate but more abstract. For example, a person never loved or felt wanted, would this person posses the tools necessary to self-actualize? I would say, no, because it takes the strength and confidence that come from love and feeling valuable by those around you to carry that strength. 2. It is important not to believe without evidence. You provide examples of individuals seeking a higher purpose and even give an analogy of “what if you were stuck on a desert Island”. However, this is highly subjective. Perhaps another person would become an animal. Perhaps you would? We don’t truly know. Perhaps you are that outlier? It doesn’t work to prove it the norm. Even if it is ideal. Also see Number 3. 3. This is stemming from my own personal experience from having a cruddy childhood. I have never been loved by my father, And both of my parents have low self esteem transferring it over to me. Thus, failure is dread for me. When I fail it reminds me of my lack in value. Which is exemplary in proving a hierarchy of needs for me since, I have not yet dealt with this lack in esteem of myself to self actualize or embrace my strengths and weaknesses, and get excited by my failures to improve. Because I don’t want to admit failure, I seek out perfectionism. Thus preventing me from self-actualizing. P.S I would love to get a response from such a thoughtful individual as yourself. It would help me out. Thanks for your detailed response to my post (you are the first person to really engage with the issues I wrote about here). I’m going to try to respond to most of your points as best I can, but I would like you to keep in mind a distinction between that which applies to you personally (and hence that which may represent statistical outliers in respect to the ways in which you fall outside social norms) and that which applies to most people most of the time. This distinction is not absolute, it can be helpful in avoiding some basic misunderstandings and confusions. You have implied (correct me if I am wrong) an absence of love and belonging in your formative years, which has in turn led to low self-esteem on your part, which again in turn has led to suboptimal outcomes for you personally. This is an unfortunately familiar story. Indeed, it could be said that it is part of the human condition to feel unloved, and to seek out love in compensation for the feeling of personal inadequacy that most of us experience. I am not trying to be dismissive of your unhappy childhood experiences, but I would urge you not to think of them as exceptional. Even if you find yourself largely in agreement with Maslow, I think Maslow held that very few individuals make it to the top of the pyramid of self-actualization. What is it that holds us back from surmounting the self-actualization pyramid? Is it lack of food, shelter, stable employment, clothing, i.e., is it the lowest level of the pyramid? Rarely, I think. And if what is crippling one’s approach to life is the painful consequences of having been unloved and unwanted, then you have proved my point for me: this has become your missing raison d’être, and the reason you feel little zest for life. 1. You ask, “…a person never loved or felt wanted, would this person posses the tools necessary to self-actualize?” I wouldn’t myself contextualize this in terms of self-actualization (your message has made me realize that I need to address this, so thanks for that), but I will try to honor the terms in which you have posed this question. And I think this is a perfect example where the distinction I made above between personal experience and statistical norms falls short. I would answer this question that, among those who felt unloved and unwanted in their formative years, probably a third can overcome this and go on to self-actualization, a third will do okay but won’t fully self-actualize, and a third will probably be emotionally crippled by the experience for the entirety of their lives. Sometimes, perhaps almost always, the big questions in life entail fundamental divisions in society between people who simply have different instinctive responses to their experiences. I learned this lesson from Joseph Campbell’s lectures, where he discusses basic religious responses to the fundamental experiences of human life. I extend this lesson beyond the sphere of religious experience and argue that in these fundamental existential experiences of life (like the nature of one’s childhood) that people are different, and they will respond differently. Some people are broken by personal tragedy, and some people are strengthened by it. This is the kind of fundamental difference in temperament to which I am referring. Similarly, some people are broken by an unhappy childhood, and some people are strengthened by it. But what this means is that moral temperament is predominant in determining life outcomes, and not the meeting of the lowest tier of Maslow’s needs hierarchy. 2. In science and philosophy it is certainly important not to believe without evidence, but all of human life is not only about believing without evidence, but of acting in definitive and decisive ways when one not only lacks evidence, but when the evidence one has is contradictory and fundamentally ambiguous. A soldier may go to war with ambiguous feelings about the righteousness of his nation’s cause, but, once in the fight, he is fully committed, not so much for the nation, as for his own life and the lives of the men in his squad. And, in a fight, what Clausewitz called the “fog of war” is pervasive: this means that our evidence is always less than optimal and may point us in the wrong direction. Nevertheless, we must act or we will be destroyed by our own inaction. And in so far as all of human life is conflict, what is true of war is true of life. 3. You’ve mentioned your own difficult childhood a couple of times in this message. You have arrived at an interpretation that implies a certain degree of clear-eyed insight into your own personal condition. How certain are you that this interpretation is the best interpretation of the conditions of your childhood? Might there be other ways of interpreting the experiences of your life? Even if you affirm that you current interpretation is the best interpretation possible at the present time, is it not possible that you can continue to reflect upon your life experiences and to achieve further and more comprehensive insights into your personal experiences and how they relate to human nature and the human condition? Unless your worldview is fixed and finished, you still have something to learn, and new insights to formulate. You write that you haven’t yet dealt with your lack of self-esteem, but I beg to differ: you have obviously thought carefully about this and come to definite conclusions. Those are the initial steps in dealing with issues like that of self-esteem. I don’t see any contradiction between pursuing perfectionism and owning your failures. We all pursue perfection imperfectly. Certainly I do. I am always caught between the tension of writing something that others can read, and waiting to post something because I know it can be better if I work on it longer. So I post a lot of imperfect material on my blog, and sometimes I am rightly scolded for it. I try to honestly own my failures, but I am not always successful even in that. So I would like to urge you, in the spirit of the comments I made in (3) above, to think further about your perfectionism and owning up to failure, and to see if you can come to further insights about your relationship to both of these difficult aspects of life. You’re welcome to write me privately at john.n.nielsen@gmail.com if you feel this is too personal to discuss in a public forum.